1 A None No Power Seat 1 A is a standard Economy Class exit row seat that has extra legroom however, the close proximity to the lavatory may be bothersome. The tray table is in the armrest, making the armrest immovable and slightly reducing seat width. There is no floor storage for this seat during take-off and landing. 1 B None No Power Seat 1 B is a standard Economy Class exit row seat that has extra legroom however, the close proximity to the lavatory may be bothersome. The tray table is in the armrest, making the armrest immovable and slightly reducing seat width. There is no floor storage for this seat during take-off and landing. 10 A None No Power Seat 10 A is a standard Economy Class seat that has an obstructed view from the window due to the location of the propeller and engine. 10 E None No Power Seat 10 E is a standard Economy Class seat that has an obstructed view from the window due to the location of the propeller and engine. 11 E None No Power Seat 11 E is a standard Economy Class seat that is missing a window. 12 A None No Power Seat 12 A is a standard Economy Class seat that has an obstructed view from the window due to the location of the propeller and engine. 12 E None No Power Seat 12 E is a standard Economy Class seat that has an obstructed view from the window due to the location of the propeller and engine. 13 A None No Power Seat 13 A is a standard Economy Class seat that has an obstructed view from the window due to the location of the propeller and engine. 13 E None No Power Seat 13 E is a standard Economy Class seat that has an obstructed view from the window due to the location of the propeller and engine. 14 A None No Power Seat 14 A is a standard Economy Class seat that has an obstructed view from the window due to the location of the propeller and engine. 14 E None No Power Seat 14 E is a standard Economy Class seat that has an obstructed view from the window due to the location of the propeller and engine. 15 A None No Power Seat 15 A is a standard Economy Class seat that has an obstructed view from the window due to the location of the propeller and engine. 15 E None No Power Seat 15 E is a standard Economy Class seat that has an obstructed view from the window due to the location of the propeller and engine. 16 A None No Power Seat 16 A is a standard Economy Class seat that has an obstructed view from the window due to the location of the propeller and engine. 16 E None No Power Seat 16 E is a standard Economy Class seat that has an obstructed view from the window due to the location of the propeller and engine. 18 D None No Power Seat 18 D is a standard Economy Class seat whose proximity to the galley may be bothersome. 19 B None No Power Seat 19 B is a standard Economy Class seat whose proximity to the galley may be bothersome. 19 D None No Power Seat 19 D is in the last row of the plane and the close proximity to the galley may be bothersome. Users have reported that this seat is quiet and passengers in these seats deplane first. 19 E None No Power Seat 19 E is in the last row of the plane and the close proximity to the galley may be bothersome. Users have reported that this seat is quiet and passengers in these seats deplane first. 2 D None No Power Seat 2 D is a standard Economy Class exit row seat that has extra legroom. The tray table is in the armrest, making the armrest immovable and slightly reducing seat width. There is no floor storage for this seat during takeoff and landing. 2 E None No Power Seat 2 E is a standard Economy Class exit row seat that has extra legroom. The tray table is in the armrest, making the armrest immovable and slightly reducing seat width. There is no floor storage for this seat during takeoff and landing. 20 A None No Power Seat 20 A is in the last row of the plane and the close proximity to the galley may be bothersome. Users have reported that this seat is quiet and passengers in these seats deplane first. 20 B None No Power Seat 20 B is in the last row of the plane and the close proximity to the galley may be bothersome. Users have reported that this seat is quiet and passengers in these seats deplane first. 7 A None No Power Seat 7 A is a standard Economy Class seat, however passengers often find this seat to be noisy due to the close proximity to the propeller. The wing and engine also block the view out the window from rows 7-16. 7 B None No Power Seat 7 B is a standard Economy Class seat, however passengers often find this seat to be noisy due to the close proximity to the propeller. 7 D None No Power Seat 7 D is a standard Economy Class seat, however passengers often find this seat to be noisy due to the close proximity to the propeller. 7 E None No Power Seat 7 E is a standard Economy Class seat, however passengers often find this seat to be noisy due to the close proximity to the propeller. The wing and engine also block the view out the window from rows 7-16. 8 A None No Power Seat 8 A is a standard Economy Class seat, however passengers often find this seat to be noisy due to the close proximity to the propeller. The wing and engine also block the view out the window from rows 7-16. 8 B None No Power Seat 8 B is a standard Economy Class seat, however passengers often find this seat to be noisy due to the close proximity to the propeller. 8 D None No Power Seat 8 D is a standard Economy Class seat, however passengers often find this seat to be noisy due to the close proximity to the propeller. 8 E None No Power Seat 8 E is a standard Economy Class seat, however passengers often find this seat to be noisy due to the close proximity to the propeller. The wing and engine also block the view out the window from rows 7-16. 9 A None No Power Seat 9 A is a standard Economy Class seat, however passengers often find this seat to be noisy due to the close proximity to the propeller. The wing and engine also block the view out the window from rows 7-16. 9 B None No Power Seat 9 B is a standard Economy Class seat, however passengers often find this seat to be noisy due to the close proximity to the propeller. 9 D None No Power Seat 9 D is a standard Economy Class seat, however passengers often find this seat to be noisy due to the close proximity to the propeller. 9 E None No Power Seat 9 E is a standard Economy Class seat, however passengers often find this seat to be noisy due to the close proximity to the propeller. The wing and engine also block the view out the window from rows 7-16. On select flights, non-alcoholic beverages and snacks are offered complimentary in addition to Northwest wines and microbrews. Alaska Airlines has several of these aircraft in their fleet, including eight in special color schemes featuring college athletic teams. 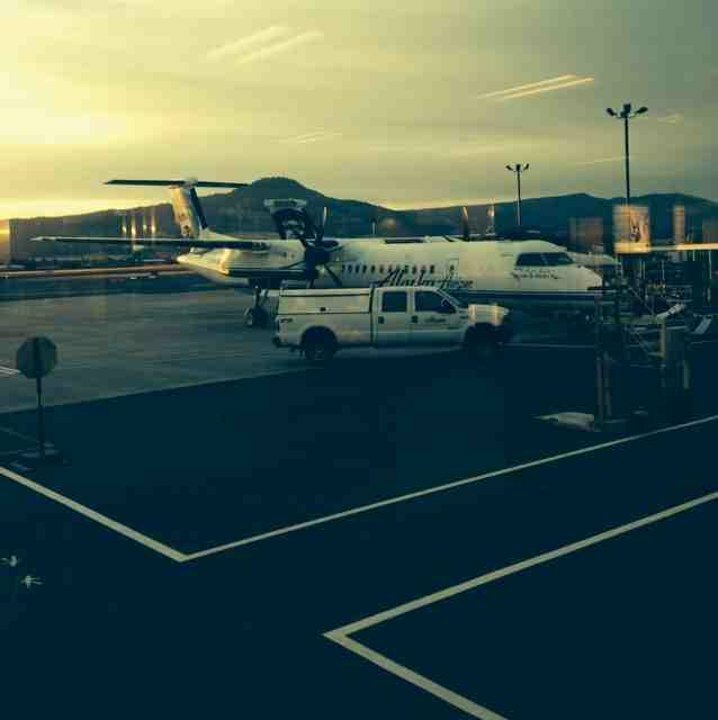 These planes are operated by Horizon Air. The windows on many of these aircraft do not have shades, so if you are flying at sunrise or sunset you may want to pick a seat on the opposite side from the sun. Although this aircraft has a 2x2 arraignment, the Q400 offers ample headroom compared to other regional jets thanks to its taller cabin design and offers leather seating as well, however, none of the seats on this aircraft recline. It also features an active noise and vibration suppression system to improve passenger comfort. Passengers are often asked to change seats due to weight considerations. Alaska Airlines also offers an "ala carte" carry-on service on these flights for larger, roll aboard bags. An agent will tag the bag and place it in the hold for customers. Upon arrival, customer baggage will be returned to them planeside. I love this plane and I love Row 20. Like others have said. Its super quiet back there. You get a quick serve from the flight attendants before they head up to the front and then get a refill once they make their way back to you. Once you go to deplane, you are one of the first off. I love this flight from SEA to Bend. 2E is right by the emergency exit door and one needs to be willing and able to deploy the door in the even of an emergency. Plenty of legroom and I disagree with some of the critiques that this is a noisy airplane. Not overly noisy at all in row 2 for a Turbo Prop. Quick down the runway and quick to rotate and take flight. Very smooth into SeaTac even though we were warned that weather was going to make it bumpy. I enjoyed it! I was sitting in seat 6B for a short flight from SEA to EUG. Thank goodness it was short. Seat 6B is like most other seats on the Q400, tight leg room and not much in width. Actually the Q400 feels very cramped everywhere. I will avoid this aircraft whenever possible. Alaska, I know you can do better. Our flight from SEA/TAC to EUG was on the trusty Q400. Our seats in roll 6 were uncomfortable to say the least. Not much leg room nor width. Best thing I can say is that I was able to store my bag under the seat in front of me. This aircraft was in serious need of some TLC; the crew were outstanding and did the best they could with this old bird. Our window looked like some one had their dog's nose up against it. All smudgy. This aircraft is noisy, bumpy, and should be put out to pasture. If Delta can fly E-175 on this same route, so should Alaska. I will avoid this aircraft at all costs. Really, I will pay more to fly on the small Delta jets if necessary. The only reason we flew this trip is we had credits we needed to use. No more. Overall, thi shas to be the most uncomfortable "airplane" there is. Not to mention the noisiest as well. My recent flight from Seattle to Pasco was pure hell. For a 55 minute flight, i thought id be okay. BUT NO. I was completely wrong. You feel everything on this plane. It feels unstable. Those of you with weak tummy's, should stay as far away from this aircraft as posssible. this seat had the shortest seatbelt I've ever seen. I had to use a seatbelt extender, which I normally do not. It lacked about 3 inches to go around me. Oddly, there was already an extender at the seat. Maybe it's a known issue! I sat in seat 2D and 1B on a recent round trip flight and I think seat 1B is the roomiest seat on the plane. Seats 1A, 2D, and 2E all have extra leg room but a floor to ceiling bulk-head so, while your knees aren't hitting the seat in front of you, you can't stretch your legs all the way out either (I'm 5'11"). Seat 2B has no bulk-head and I did not find people using the bathroom to be bothersome since the bathroom door is right next to the cockpit door instead of diagonal from row 1. My wife, however, is 5'3" and she was able to use the bulk-head in seat 2E as a foot rest so that row may be ideal for shorter passengers. Yall are crazy. The last row on either side of the Q400 are the best. It's quiet back there. Very quiet. Propellers are aligned at about seat row 5, so it is noisy in this row, particularly in the window seats. Fine if you have noise canceling headphones. While others may not like this seat I appreciated the lack of one window. It cut down on the amount of sunrise I got in my eyes while resting. I enjoyed being in Row 6 the window seat. The views are better in front of the wing and even after all these years, I still get nervous if I sit on the prop line. Second time sitting in the back row, and I'll continue to do so. We got served first by the flight attendants before they moved to the front of the plane and we got off the plane first. The only drawback is no recline, but I don't recline my seat so its no big deal to me. Often you are de-planed out the back so you are first off. The flight attendants often offer a beverage to this row before they take the cart up to the front. And you are as far away from the restroom as you can get. A plus in my book. I had an intresting expirience flying in an Alaskan Airlines on the q400, but I had some problems. I enjoyed the comfort, and i was used to the comfort of Alaskan Airlines. So i was flying from Seatac to Loreto, Mexico and on the way we were arranged to make a stop at la to refuel. Anyway, we got through LA fine, but on our way to Mexico, the bathroom ran out of water. I was suprized because I expectied Alaskan Airlines to keep on going to Mexico, but the plane turned around and head BACK TO LA where we spent the night. The next day we succecfully made it to Mexico wthout any problems. The last two rows, 19 & 20, are my favorites as the passengers are loaded and deplaned from the rear as well as the front. The restroom is in the front so you don't have people lined up next to your seat waiting to use it, not to mention the odors that typically emit from it. The galley is in the rear but it is not a problem. The last two rows are served first before the beverage cart moves to the front to begin service to the rest of the passengers. This seat was uncomfortably cold due to being next to the exit door. It's probably one of the last seats I'd choose on this airplane. First off the whole back end of this aircraft needs to have the stock "proximity to the lav" comments removed... there is no lav back there. Additionally the last few rows should be tagged with the positive of being some of the first to deplane, as the rear door almost always seems to be open FIRST and it's quick and easy to exit that way. I disagree with the claimed 31" of pitch on these seats. I'm 6'2" and yesterday flew on three different aircraft in seats claiming 31" of pitch. The Q400 was the only one of those three aircraft where my knees were painfully logged against the seat in front of me for the entire flight. All of the seats on these planes are not very comfortable. The seats don't recline there is very little padding and very little legroom. Row 19 is marked in red but it is no worse than any of the other seats. The seats in the back should have a mixed review, at worst. For short flights, the seats at the back are not at all bothersome. No restroom back there, so passengers are wandering back; just the flight attendants. You get on and off first and its the engine noise is pretty minimal compared to a lot of seats on these planes. Seat 1A legroom is reduced by a barrier, but 1B is not . Q400 is a modern prop plane; loved it! Noise was not as intrusive at rear of plane; in fact, I left the plan not feeling half deaf for a change. I am male, 6' 4", 254lbs. and usually have my knees squeezed up against the seat in front of me, and if they recline, I'm in pain the entire flight. Yes, this plane has less padding on the seats, yes the seats do not recline, but the less noise, deplaning out front and rear of plan, plus carry-ons stowed below for you, not to mention free beer and wine (with a cookie that granddaughter loved) was great! No nuts that I could see, maybe they never serve them? May want to ask if you have peanut allergies? I can not wait to fly this wonderful prop again - wife is scared of flying, her father was an instructor in U.S. Air Force, taught prop engines and she found great comfort in seeing that beautiful new prop pull up to our gate! We flew from Portland to Sacramento in 1 hour and 26 minutes. At first blush, we were seriously disappointed in flying a prop! But once seated we found the seats very comfortable. Being in the rear made ingress and egress very easy and fast. 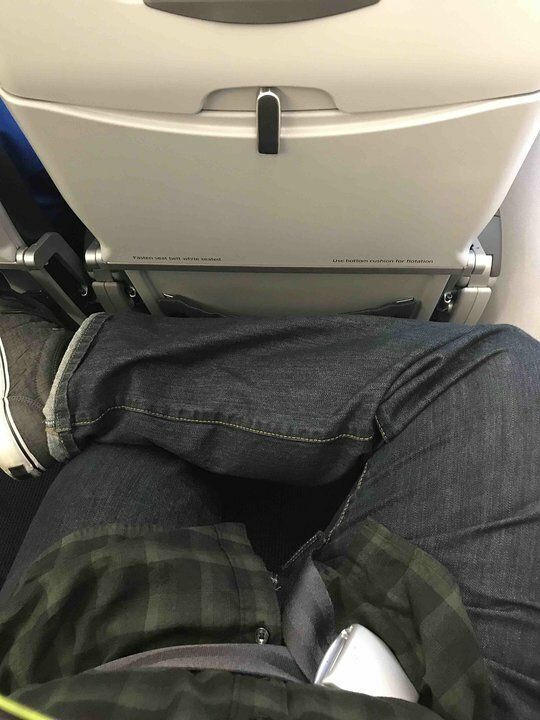 I'm 6'2" 280 lbs (mostly muscle) and sat in the aisle seat. Plenty of leg room, wide enough and leather seating made it very comfortable to sit for this short length of time. But Not longer. We normally fly business but that's not available here. Views were great, staff terrific. Be forewarned, 1 restroom in front of the plane. Noise from the turbo props were not intrusive so we didn't mind it all. They claim the overhead is small so they take your carry ons and place them in the hold. Great, the overheads were roomy and easy to place other items. So, we'd fly this plane for this distance and time always if we could! Great seat if you want a view of the Q400 prop slightly behind you. Standard legroom and two windows to look out of. Unlike seat 1B, which really is not affected by the bulkhead, seat 1A has less legroom than standard seats. Chose 2D & 2E for hubby and me based on SeatGuru green light! Yes, good seats. Be aware that they are exit row and the flight attendants make you put EVERYTHING away -- no laptops, no Kindle, nothing for takeoff and landing. It's a bulkhead exit row so that means stow up top. It's a short flight so really nothing to use the whole flight. 2 windows, comfortable and quiet! While it is close to the galley, there's not much going on the galley. The plus is that the last few rows really are quiet compared to the rest of the aircraft; plus they board front and back, so you're usually 1st off. I tend to slouch when I sit so I'm especially sensitive to seat pitch. This feels quite roomy for 31 inches because of the thinner seating and non-reclining seats. The seating is comfortable with enough padding for shorter flights; I wouldn't want to fly longer than two hours in one of these, though. The cabin is a bit louder but acceptable for a turboprop - even when you sit near the propellers. The staff is awesome! I've flown a number of Horizon Air Q400's and everyone from the gate people to the pilots and flight attendants have been cheerful, friendly and helpful. Noise level was 77 dB at seated head level on my smartph sound app. Definitely quieter here than on 6B going opposite direction. In fact, I wonder if the active sound suppression was not operating on the outgoing flight. 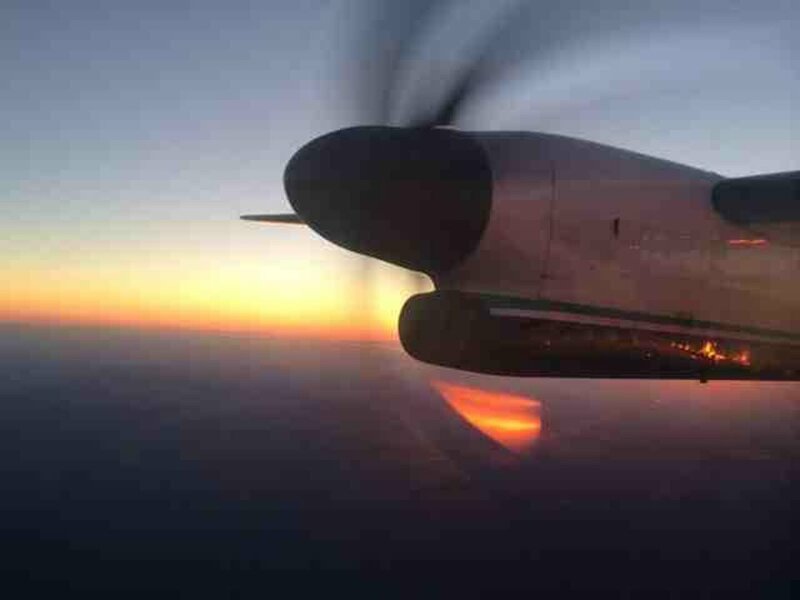 Q400 experiences a fair amount of small plane bumps and waggles when it gets into choppy air. In moderately rough air, it doesn't fare as well for passenger comfort compared to the CRJ. Q400 takeoff and landing seem to take less room and time. Passenger loading and deplaning is faster when front and rear doors are used. Duck down when entering as the clearance is a bit low I agree that sitting toward the back makes the cabin feel bigger. There is only 1 lavatory - 2nd door on the right as you approach the cockpit. It's bigger than the one on the CRJ, but there is no sink or running water. I am 5" 11" and the seat was a bit narrow with no seat padding at all. The pitch was good and the noise and vibration were both acceptable. Row 11 is a bit strange with missing windows but this is not a big deal. I would not want to be on this plane for more than 1 1/2 hours or so as it is somewhat tight. Short flights, good; long flights, no way. Alaska (Horizon) staff, awesome! Very noisy on takeoff but smooths out after the first few minutes in the air. Cruising noise level at ear height was 80 dB on my sound app, a couple more toward the window or near the floor. Duck down when entering. I'm 5'9" and the top of my head skimmed the top of the forward left door as I entered. Can't believe there are so many positive comments on this torture machine--must have come from folks on the shorter side. This is THE most uncomfortable, noisy plane I have ever been on. Should not be allowed to fly routes any longer than 45 minutes! The flight from Seattle to Reno is way too long to sit crammed in like a sardine. Awesome airplane. 1000x better than a similar-sized CRJ regional jet. The seats don't recline, but it surprisingly wasn't that bad- it doesn't feel bolt-upright like most other airline seats do when not reclined- they were actually reasonable comfortable to sit in. Don't be scared away by the fact that it's a turboprop- Q400's are designed to have no more noise than a jet, & they fly just as fast as the jets do. They tend to fly a bit lower to the ground- around 25,000 ft. typically, which gives you awesome views of the scenery around the great NorthWest. If you're lucky, you might even get to fly in one of the Q400's painted in the colors of a college sports team in Alaska's service area! I have flown on the Q400 many times and sat in different areas on the plane. Compared to all turbo props ive been on it is a fairly quiet aircraft and very smooth. I mainly fly the BOI-PDX or SEA route and back and once on the MRY-SAN route. Ill be flying on it this July on the BOI-PDX route and back. They are comfortable and should stay in service for many years to come. I didn't have any issue with the proximity to the lavatory. It was far enough in front of me that people waiting didn't interfere with me. Seat 1A was very cold, I ended up moving to Seat 1B (the row was empty). There is no under seat storage either. I fly between SEA/PDX-FAT multiple times throughout the year and it's a 2+ hour flight on the Q400. I always try and get seats 20A/B. It is very quiet toward the back of the plane and flight attendants will usually serve you first and then go and serve from the front forward. Also, the Q400 is boarded from both the front and back so you will be one of the first people off the plane. The only downside is the fact the restroom is at the front of the aircraft. Horizon hasn't yet succumbed to the big airline cattle car philosophy, so each time I fly the Q400, it is a cut above the others. Cons: no TV or plug-ins, but flights are typically short as this is a short range aircraft. Noisy prop in the center of the cabin, so just bring along some ear plugs (also supplied by Horizon). Pros: No middle seat, planeside baggage a la carte service, complimentary beer and wine. At first I wasn't thrilled about flying a turboprop, but I must say these are more comfortable than similarly-sized regional jets...or being stuck in a middle seat on a larger jet! My seat didn't recline, but that's my only complaint regarding comfort. The planes fly lower and views are spectacular. Sit at the front or back of the plane for the best views and less engine noise. The flight from PDX to OAK takes a few minutes longer than a 737 would, but you don't really notice the difference. Horizon's excellent service and free beer and wine well make up for it. I have been flying SAN/FAT for 6 months on the Q400. I'm 6-2/235# and dread someone my size sitting next to me. It is VERY uncomfortable. The seats on the Q400 are hard, and I hope they are better floatation devices than seat bottoms. For someone my size or larger, choose a window seat so you won't stick out into the aisle and get bumped by every passerby. This aircraft has one lav and don't be surprised if there is no water; only hand sanitizer. I am a flight attendant for Horizon Air. The Q400 is the only plane in our fleet. The props are noisy - especially around rows 8-12, but we always have earplugs onboard. Just ask. And because the wings are attached above the windows we offer spectacular views. Glad to hear so many enjoy our complimentary wine and beer service. It's our privilege to serve you! PROS: I flew on this aircraft for the first time recently (PDX to OAK, OAK to PDX). At first I was kinda freaking out (props, yikes!). But once after take-off it was so smooth and relaxing. I kinda liked the noise of the plane, too. Noisy, but not loud noisy... a nice white noise. I have flown on military cargo/troop planes, and the Q400 plane is NOTHING like that kind of noise. Not only did I love the plane, but I loved the first class service from the Alaska crew. I'm flying again in a few days and am looking so forward to my Alaska flight. It's my new happy place. No carry-on luggage to wrangle on the way to your seat as there is a drop-off at the plane and your luggage is stowed for you and retrieved upon exiting. I could not love the plane-side luggage service more! The Q400 flies lower than regular planes, so the views below are spectacular! Cons: The Q400 is kinda squishy, so I recommend sitting as far back as possible so the plane "feels" bigger. Slightly noisy since you're behind the prop/engine. But great view out the rear of the plane. No room to stretch out. Seats recline about 2 inches, that's it. Bring ear plugs or headphones to reduce the stress you feel from the noise. I love this aircraft. Perfect for mountain flying in "unusual" air conditions. And Horizon does have impeccable service. Best in the land. Flew on this plane in August of 2007. Being a Turboprop, It was a tad noisy, but the service was impeccable, With complementary beer and wine. First Class Service at coach prices. If this airline decides to service the east coast I'd eat out of their hands! I sat in this seat from Boise to Seattle and it was fairly noisy being a turbo-prop, but at the same time all my other turbo-prop flights this was the quietest one I do enjoy flying on the Q400 and will be going on 3 this summer. 2370 San Jose to Portland Oregon. The MOST stressful flight I have ever taken due to the noise of the plane (I was in seat 6B, but ALL of plane was noisy). You need to scrap this plane or issue heavy duty ear plugs! Can't believe it passed FAA approval! Alaska Airlines flies 1 versions of Bombardier Q400.